Above the Mission – Just Stop and Paint It! 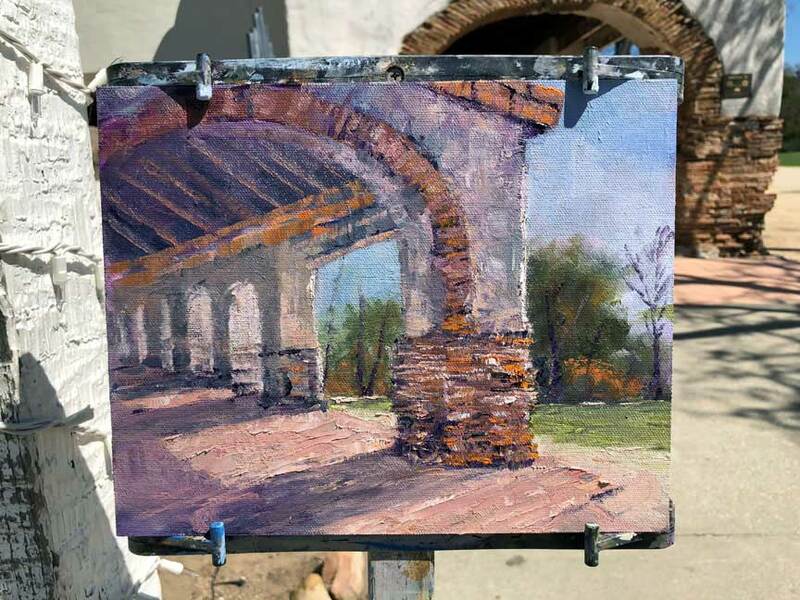 So, the plan was to join the Los Gatos group at the weekly paint-out, this time at San Juan Bautista Mission, CA. The mission is one of 21 religious outposts established by the Spanish, and this one was finished in 1812. I have painted there a number of times, and generally paint the mission itself. Once again, I wanted to capture the artists painting from above with my DJI Mavic Pro drone. I checked beforehand and there were no drone restrictions in San Juan Bautista. California State parks are generally have no drone restrictions, but some restrict depending on the county, district, or park. Upon arrival, my iPhone was on low battery. I had it on charge all night, but for some reason didn’t charge. An iPhone or other mobile device is not absolutely necessary to fly the drone, but it sure helps, and you are somewhat flying blind without it. I had no good way of charging it without running my car engine for awhile, so decided to limit my flying time. I also didn’t want to disturb the peace and quiet around the mission in the clear crisp morning, and kept to a fairly high altitude. The sound of the drone did carry much further in the cool morning air. …and a few photos of the day…. I think I will just leave this as a color and value study.